My whole family had been to the museum in Newport News before I finally visited it. But I should have known better. After all, it's my father in law's favorite museum (and Dad's never wrong!). So when I finally went there a few years ago (thanks to a great Groupon deal offering membership to the museum), I thought "What was I waiting for all those years?" 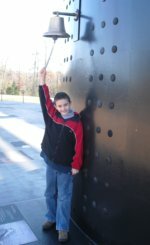 Even my 3rd-grader loved the museum! If you love boats, ships, and maritime artifacts, this is the museum for you. Even if such things don't float your boat (yes, a shameful pun on my part! 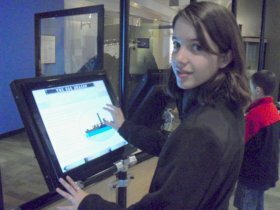 ), you'll appreciate the videos, displays, and hands-on, interactive exhibits. 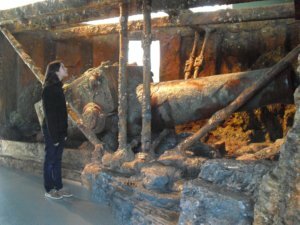 See the Monitor's turret raised from the bottom of the ocean! There's only one thing I was disappointed about at the museum. Being a real Titanic buff, I wish their Titanic section was bigger. It's quite small and doesn't hold a single artifact original to the ship. But they do hold an excellent home school event, "Titanic Day," on April 15th every year to commemorate the anniversary of the Titanic's sinking. We attended it this year and it was so much fun! They had people in costume, lectures, and hands-on activities like making postcards and fans, and learning how to use a telegraph and "read" Morse code. The museum also hosts visiting exhibits which are included with regular admission. Examples include last year's "Coffee: The World in your Cup" which detailed the fascinating history of facts you never realized about your cup of joe, including the origins in Ethiopia of the world's favorite drink, how coffee is made and packaged, and the very special role the sea plays in making sure you get your Java each morning. Upcoming traveling exhibits for this year include "Polynesian Voyagers." Starting Nov. 17, 2018, admission is just $1 per person, every operating day. Hard to believe, but it's true. One of the best museum bargains I've ever seen! Don't believe me? Check out their website. Add a 3D movie for $6 more per person. For $6 extra, you can enjoy a 3D movie on maritime topics, such as "Sea Rex 3D: Journey to a Prehistoric World." Hours: Mondays–Sat - 9 am to 5 pm; Sunday: 11 am-5 pm - The Mariners Museum is closed Thanksgiving and Christmas. For several years, the museum offered free outdoor concerts near the bank of the museum's Lake Maury every Thursday during the summer, but they've ended these events. However, they are having a Celebrate the Park event on June 24. 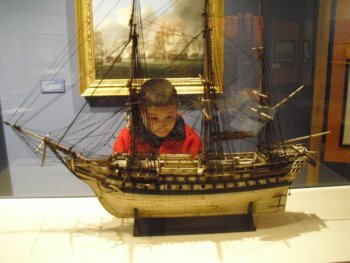 The museum does offer "Maritime Mondays" every other Monday at 10:30 am in the summer where kids ages 18 months through 5 years can make hear a story and make a craft. They also offer a Spanish version of this event called "Miercoles Maritimo," which meets Wednesdays at 10:30 am. Food, Parking...and don't forget to feed the turtles! There is ample free parking at the museum. They have a cafeteria where you can buy lunch fare. Or, bring a picnic lunch and eat while you stroll along the banks of Lake Maury. And don't forget to save some bread to feed the turtle in the water as you go over the 14 bridges! The park and trail adjacent to the museum is a wonderful place to walk or run for free (open 6 am to 6 pm) and enjoy a picnic lunch. Phone: (757) 596-2222. Their website is http://www.marinersmuseum.org/. One of our favorite attractions is just a five minute drive away. The Virginia Living Museum is a fabulous zoo/museum/aquarium all rolled into one. Just a block up the street from the entrance to the museum you'll find a Panera Bread and a Moe's Southwestern restaurant, one of our favorite cheap places to dine. If you love to shop, a 10-minute drive west will get you to Jefferson Commons, a shopping mall filled with a Kohl's, TJ Maxx, Marshall's, Trader Joe's, Five Below, and more. For a lovely way to end the day, go east to Route 17 and the James River Bridge and you'll find the Crab Shack, where you can dine on fresh seafood (and a mean she-crab soup) as you watch the sunset over the river!